At a textile factory in Dhaka District, People’s Republic of Bangladesh, workers were beginning to worry. Increasing evidence warned them that the building was unsafe — such as cracks in the walls and structural shaking. Most were nervous to return to their jobs. But their employers told them they had no choice — get back to work, everything was fine. April 24 marks the fifth anniversary of the tragedy of Rana Plaza. On that day in 2013, 1,127 employees died when the building collapsed. Searches went on until May 13, with firefighters, soldiers and police officers digging through the rubble trying to find more bodies beneath the debris. By that point the number had risen to 1,134. 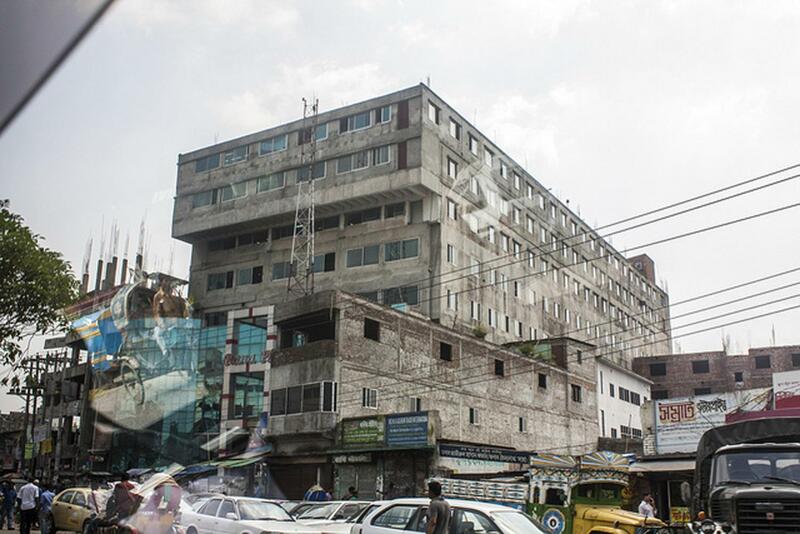 Rana Plaza was a building in Bangladesh that housed many clothing factories, where department stores such as JC Penny, the Children’s Place and Walmart held their production. The building’s collapse was one of the largest industrial accidents the world has ever seen, but isn’t the only one of its kind. Many clothing factories in the Global South are structurally unsafe, and unfortunately, these dangerous workplaces are the source of a majority of Western clothing companies’ merchandise. These clothes start off in the hands of poor garment workers, who work long hours in terrible conditions for an average of $68 a month. The goods are then shipped to Western countries, where they appear in our favorite stores, including Abercrombie & Fitch, Forever 21, H&M, Walmart, Macy’s, Nordstrom — the list goes on. What these companies have in common is that they all use sweatshop labor. Simply put, companies outsource their clothing production to less developed countries, like Bangladesh, because it’s easy to exploit workers there. Most people in the Global South have no other choice but to work at a factory for minimal amounts of money. There just aren’t any other jobs — or if there are, they are potentially more dangerous than working in a factory. Companies use this as an opportunity to ignore workers’ rights, force laborers to work 14-hour days and pay them meager salaries. How does this translate to us as consumers in the West? The answer is complicated. Improving technology over the past 20 years or so has made quick and cheap outsourcing possible, and the extra items produced by workers in the developing world need to go somewhere. Thus, retailers introduced the phenomenon of fast fashion to Western consumer culture around the turn of the millenium. Instead of just two seasons of fashion per year, there are now about 52 seasons of fashion per year, with new, cheaply made clothes filling up stores every week or so. As a result, I’ve noticed that every time I go into a store, the clothes are always different. There’s a rhetoric of “Need it now!” and “Buy it before it’s gone!” — before the next batch of fast fashion is shipped in. Western consumers are only too eager to comply — fast fashion sales in the United Kingdom, for example, increased 21 percent from 2014 to 2017. After all, who can resist that $7 dress and mindless advertising? One of the biggest issues is a lack of awareness. After watching the 2015 documentary “The True Cost,” directed by Andrew Morgan, I was horrified. I couldn’t believe people just sat back and let such clear violations of human rights continue. Even walking past a Forever 21 on the street made me sick. But part of the issue is people don’t know about it. They see the label on their clothes and they don’t really think about what it means — which is exactly what these giant corporations need from us. Next time you’re getting dressed or purchasing a new pair of jeans, look at the label inside. Does it say Made in China or Made in Bangladesh? India, Vietnam, Indonesia — these are just some of the more popular places companies will go to exploit extreme poverty. It is as much our responsibility as it is the duty of the brands to support our fellow humans who live elsewhere. Part of that responsibility is awareness, both of the situation and of how our own actions can affect it. Any time we hand over our money to a company that uses sweatshop labor, we endorse it. Of course, it isn’t an easy thing to shop ethically all the time — in fact, it’s quite difficult in a global world. But there are certainly ways that we can be aware as consumers and try to shop ethically as much as possible. First, we can support ethical brands. This means researching the brands you buy from. Just type “ethical brands for” whatever you want into Google. You can also look for companies that are fair trade — meaning the company pays fair prices to producers in developing countries. An example of one in Pittsburgh is the Culture Shop, with locations on East Carson Street in the South Side and on South Craig Street in Oakland. Stores like these don’t come with a cheap price tag. One of the biggest issues with ethical and fair trade brands is that they can sometimes be very expensive. If this is the case for you, another tactic to keep in mind is shopping vintage or thrifting when possible. By purchasing clothes from these locations, you aren’t endorsing companies that use sweatshop labor, and you are also most likely supporting a small business. An integral part of fast fashion culture is consumers’ willingness to buy clothes they only somewhat like because they’re cheap. Next time you’re shopping, only go for clothes that are high quality or that you absolutely love. This wasteful, materialistic aspect of our culture is a large contributor to the existence of sweatshop labor. It’s also very important to love, value and take good care of the clothes that you already own. Make them last. Keep in mind the victims of Rana Plaza on April 24. This tragedy may have happened five years ago, but the details behind it are more relevant than ever, and the decisions we make today can have a positive effect on preventing more tragedy from happening in the future.